You guys are going to love Sarah and John’s engagement session at Durand and Ontario Beach Park! They were just so adorable together and were making each other laugh the entire time. Sarah and I have actually been friends since we were 10 years old and started playing soccer together. We both still love to play, but I think Sarah’s heart is a little more attached to volleyball now! She and John first started their relationship thanks to a volleyball team put together by some mutual friends! These two completely fell for each other while playing together at Hot Shots every week and hanging out at Jeremiah’s after the games. Sarah’s soccer number was always 15, and it’s so fun how that number keeps popping up in her and John’s relationship! Their anniversary is on May 15th, and John proposed on their 15 month anniversary (at Jeremiah’s, after a volleyball game)! They couldn’t find a wedding venue with a 15th wedding date available though. Dang. Haha. We were so lucky that the carousel at Ontario Beach Park was actually OPEN when we got there! I learned that it’s actually more difficult than I anticipated to balance on a moving carousel and take pictures haha. But totally worth it for the cute shots we got. After Sarah and John changed into their more volleyball-appropriate outfits, the sun was just starting to set which gave us some beautiful colors over Lake Ontario! We couldn’t have asked for a more beautiful fall evening. 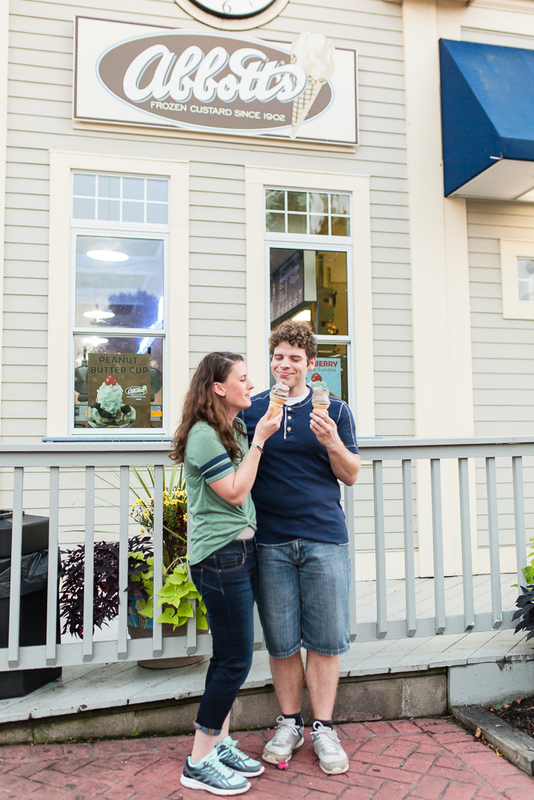 And we ended the night the way all good Rochesterians do after a day at the beach - with some Abbott’s frozen custard!